What are the Best Home Gyms to Buy in 2017? Health is precious and something that’s constantly fleeting due to the aging process, poor diet and lack of exercise. Working out for at least 30 minutes at a moderate intensity level every day can set the clock back by years and keep you looking and feeling younger for longer. Regular daily exercise helps to balance stress levels, keep our body weight in the “ideal range”, release endorphins into our bloodstream and improves the length and quality of our sleep. Going to the local gym just isn’t an option for some people and can be a big stumbling block to getting in shape for many. For some of us, the best way to get and stay in shape is to have a small, dedicated area in our home or garage with a home-based gym that offers all the exercises needed to get a tight and toned body. The initial cost of buying a home gym might seem stifling, but consider that the average cost of a gym membership is currently around $58 a month and rising steadily. Add on to that initiation fees, charges for lost cards, etc., and the cost of a gym membership can total $800 or more (source). When you workout at the local gym, you have to workout at the pace set by the other people using the facility – rushing to finish sets when someone’s waiting on the equipment you’re using, taking unnecessary rests while waiting for the next station to open up, etc. Not to mention the stress of sweating and changing/showering around other people. Very few gyms offer 24-hour service, meaning you have to schedule your workouts around the gym’s hours, trying to fit them into your work and downtime schedule. Once assembled, your home gym will always be ready to accommodate you. No more sacrificing the quality of your workouts by forcing yourself to workout when you’re physically or mentally drained, or being forced to workout during peak hours when equipment availability is sparse just because that’s all your schedule allows. The worst thing about working out at a gym is being put in a position where you want to do a complete resistance routine, using at least a few different pieces of equipment, and being forced to wait in the line. Or to abide by the gym’s equipment usage policy which usually puts a time limit on how long you can use a machine during peak times. This hampers your focus during exercise and ultimately robs you of the total end benefits you could be enjoying. The goal of a workout is to work each muscle to failure while keeping your heart rate elevated in the fat-burning zone for 20 – 30 minutes at least. When you buy a home gym that has the core exercises you enjoy, downtime between sets and exercises is seconds rather than minutes. Owning your own home gym gives you more time to devote to your health and fitness without wasting hours every month getting to the gym, potentially sitting in traffic doing nothing but feeling stressed, waiting in line for people to get off the equipment you want to use, being forced into conversations you don’t want to have and finally, driving or walking home! With a home gym, the number of legitimate excuses you can come up with to skip a workout is slashed by around 99 percent. The only excuse, other than the last minute emergency, is flat out laziness. Time is no longer an issue; a good workout takes less than a half hour and you no longer have to travel back and forth or wait in line for equipment. Scheduling isn’t a problem any longer; we all have to go home sometime and your home gym will always be ready when you are. Cost should never be an issue; a good all-in-one home gym will easily pay for itself with all the travel costs and gym fees it saves inside a year or two, without the hassle of dealing with monthly fees. No more skipping the gym because “Joe Weirdo” is going to be there and you don’t want to deal with him; you’re alone or at least have control of who works out with you in your house. The only benefit to going to the health club is to use the pool or sauna, and many gyms out there don’t even offer such luxuries! Commercial gyms have their place, but if you value your time and want an easier way to get in shape and do your resistance training on your schedule while keeping more cash in your bank account; a home gym is the only way to go. In the following paragraphs, we’ve selected and reviewed the very best-of-the-best home gym equipment on the market this year. Some have stood the test of time for years, whereas others are new releases that offer more advanced features their predecessors did not. All-in-one gyms offer a lot of advantages to the home user. Depending on which product you end up going with, you’ll usually get the option to do anywhere from 30 to 100 gym-quality exercises with easily adjusted resistance. They’re also a much safer option for beginners or people who just flat want to work out at home. With all-in-one home gyms, there’s need for a spotter when performing potentially dangerous exercises like the bench, shoulder, or leg press. A wide variety of gym-quality exercises offered. Very safe – no spotters required. Easy to change resistance compared to plate loaded machines. Usually, take up less space than free-weight stations and equipment. A range of motion is engineered to reduce strain and injury. Most are only designed to offer a maximum of 300-ish pounds resistance for upper body and few offer core leg exercises like squat or leg press. Some designs can make getting in and out of the machine difficult due to the manufacturer’s attempt to reduce the overall dimensions of the gym, leaving the user feeling restricted with all the attachments nearby. Poor quality all-in-ones won’t offer much in the way of height adjustment for people who’re taller than average height (5’10). Few all-in-ones are able to fold up for easy out-of-the-way storage in a closet or small corner. Some people find the resistance and range of motion to be inaccurate and unnatural on poorer-quality machines. All-in-ones are the perfect choice for a home user looking for a large range of resistance exercises without taking up a ton of space in their home. As so often with any product, you do get what you pay for, but that doesn’t mean you have to break the bank to get the best quality gyms out there. Below, you’ll find what we consider to be the top home gyms of the year. Some are new to the market, representing the best in modern technology, while others have been around for a while but still manage to maintain their popularity due to quality, durability, and ease-of-use. Note that all the machines rated on this page come with a beginner’s workout guide of some sort (text and/or DVD), and assembly instructions if required. You don’t need to spend thousands of dollars for the privilege of doing gym quality exercises at home. These top 3 all-in-ones are perfect for beginners and intermediates who’re serious about getting into shape at home, but not necessarily looking for massive amounts of resistance or upgrade options. The Blaze is one of Bowflex’s best selling machines of all time. It’s versatile in the upper and lower body exercises it offers and doesn’t take up a great deal of space. With Bowflex’s patented Power Rod Technology, there’s also no worry about making a lot of noise with this machine, meaning you can work out anytime without disturbing your family or neighbors. Small footprint for an all-in-one: L 90″ x W 38″ x H 83″ (folded: L 52” x W 38” x H 83”). Easier than the majority of home gyms for assembly. 5-year warranty on machine and lifetime on Power Rods. This sub $1000 home gym is a great option for those who’re already physically fit and for beginners who’re looking to get into shape and not get bored while doing so. The 210 pounds of resistance is a great starting point for most. As you get stronger, upgrades are available in 100-pound increments, making the Blaze a smart choice if you’re planning on working out at home for years to come. Excellent build quality on all parts. Can work all major muscle groups with up to 60 exercise available. Comes with 210 pounds of resistance and is upgradeable to 410 with the purchase of additional Power Rods (the fact that they have a lifetime warranty is a massive bonus). Includes squat station (compound leg exercises are often missing from lower-cost all-in-one home gyms). Rowing station included for aerobic exercise. Cables and power bar resistance make this machine nearly silent when using it. Included multi-function grip, bar and cuff attachments allow multiple angles to hit every muscle group hard. 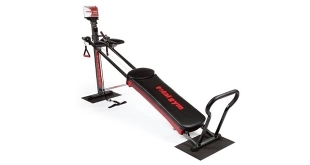 Really low price compared to the PR3000, which is around the same price and offers fewer exercises – and a way better value than the PR1000 model, which is half the price but offers half the exercises of the Blaze and no resistance upgrade options. Though the 410 pounds of available resistance is perfect for building a toned and sculpted body, this isn’t something you’re going to buy if you aspire to be a professional bodybuilder or power lifter. People who start using the Blaze after using free-weights and/or stacked cable machines find that the resistance from the Power Bars isn’t quite the same (either doesn’t feel the same and/or doesn’t feel as heavy). This isn’t an issue if you plan to use the Blaze exclusively for all your workouts). While the Blaze does fold up to nearly half its length, neither height nor width is adjustable, meaning you’ll need to dedicate a large corner of a room to use it. If you’re above-average height (5’10), the lat pulldown and leg station exercises (extension and squat) may limit your range of motion. A range of motion isn’t quite as refined as the new Revolution but still offers a better than average home workout with tons of resistance. Don’t rely on the resistance of this machine equaling that of a traditional stack machine or free-weight exercises. But don’t focus on this factor either if you’re looking for an easy and compact machine in your home to help you get in shape fast. The Blaze is hands-down, the best Bowflex machine under $1000, bested only by the megalith that is the Revolution reviewed later on. 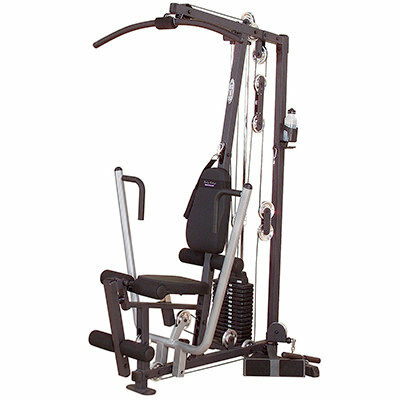 There are near limitless angles offered on many of the exercises you can do on this machine. You’ll never get bored using the Blaze. Check on Amazon for more info! The BSG10X from Powerline is an indestructible piece of equipment that will never let you down when a hard workout is in order. The most attractive feature, outside the array of gym quality exercises available and build quality, is the fact that it comes to your door almost entirely preassembled. This home gym is for people who’re looking to get (and stay) in great shape without leaving the comforts of home base. A Nice footprint at L 72” x W 42” x H 80”. Comes 90% preassembled – only 9 bolts need to be fastened by the owner for installation. 10-year warranty on 11-gauge frame, 1 year on everything else. 40 gym-quality movements that hit all major body groups. Sturdy parts including a thick 11-gauge frame and “military grade” cables rated to 2200lb tensile strength. 160-pound weight stack made of concrete encased in rubberized plastic to reduce the loud noise associated with steel weights. Smooth pulleys with whisper-quiet operation. The Super easy 9-bolt installation has you working out faster with minimal frustration (no confusing diagrams). Well-designed 8 position, biomechanically-designed press arm allows for a complete upper body workout. Multiple seat positions to accommodate every member of the family and allow for multiple seated angles while doing different exercises. Includes 48” lat bar, a shorter low row bar, and ab harness – which are all designed to accommodate many upper body positions and angles to work back arms, and core muscles more effectively. This is another inexpensive home gym that’s limited to under 200 pounds of resistance. Adding extra plates is easy by purchasing a set of add-on plates, but Powerline’s warranty doesn’t support adding extra weight to the stack so doing so will surely void your warranty. Leg movements are limited to leg extensions for the quads and single leg hamstring curls with the base unit, you’ll have to find another way if you want to do compound leg movements. There is no rowing or other cardio option included, such as the rower offered on the Blaze. Doesn’t fold up for compact stowing in the corner of the room when you’re not using it. Without a cushioned workout mat, this 400-pound home gym can permanently indent high-pile carpeting (a mat is advised whenever you’re installing a machine on the carpet, just to be safe). The 10-year warranty on the 11-gauge square and circular tubing is great. However, the 1-year guarantee on every other part of the machine could be better in order to compete with others on the list. The limited resistance and lack of included leg press attachment might be a real deal-killer for some people. However, Powerline has seriously overbuilt the BSG10X and made it incredibly safe for the whole family with this stack based cable unit. With 11-gauge steel holding it together and the 2200lb tensile strength cables, along with the ability to do somewhere in the range of 40 gym quality exercises, the BSG10X is in the top 3 in the under $1000 category for a reason. The 9-bolt installation is a real plus for a stack-based all-in-one. The G1S from Body-Solid is an interesting piece of equipment for this category. The frame is very sturdy and rigid, using 12-gauge steel, and the 2200lb tensile strength cables ensure you’re always safe no matter what exercises you’re performing. The no-cable-change “Selectorized” design from Body-Solid makes the G1S extremely convenient and easy to use. While the installation may leave you a little frazzled, the effort will quickly be worth it as you start to see the changes that your workouts on the G1S start to have on your body. Really nice small footprint coming in at L 49” x W 36” x H 83”. Moderate to difficult installation reported by several buyers. Lifetime, an in-home warranty that covers absolutely everything. 40 gym quality exercises to choose from on the G1S. 12-gauge steel frame with 2200lb tensile strength cables. Silent cable bearings that require no maintenance. Quality and durability based on the company’s bestselling EXM1500S. Space saving design with a small length and width footprint that still offers the same amount of quality exercises that larger home gyms do. Works with most other commercial cable attachments (we recommend Champion for durability and reasonable pricing). Box includes lots of extras including lat bar, straight bar, ankle strap, ab strap, instructional Total Body Workout DVD, and a water bottle and towel holder. Body-Solid’s “Selectorized” no cable-change-design makes it so easy to switch between exercises. Body-Solid is a trusted name that’s been around for two and a half decades. The full lifetime warranty on all parts. If you’re looking for bottom-of-the-bin sort of workout equipment with the quality (and price) to match, Body-Solid isn’t for you. There are cheaper manufacturers, of course, you’ll never find them offering a lifetime warranty on their parts either. You’ll have to read directions carefully to make sure you’re using the correct parts and fasteners while putting the gym together. The GS1 only offers leg extensions and leg curls, no squat or leg press attachment if you want to do compound movements. Limited to 160 pounds – no company supported resistance upgrade option. The Body-Solid G1S Selectorized is easily the most solidly-built home gym on this list. The 12-gauge frame means you never have to worry about throwing a little reasonable abuse at it while working out vigorously. The lack of a compound leg exercise or option to purchase an add-on for one may be a drawback to some, but users looking to tone and stay in shape won’t be disappointed. The lifetime warranty is above and beyond what you’ll find in this price category. 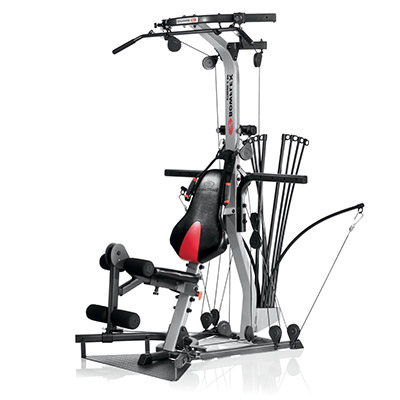 If you’re looking for the best bang-for-buck in this price category, our #1 has to be Bowflex Blaze. It includes at least 20 more exercises (60 total) than the Powerline or Body-Solid machines while offering over double the available resistance and a pretty decent rower for cardio. Lack of available compound exercises for the legs such as squat or leg press is a real drawback when looking at home gym machines in this price range. The Blaze is one of a few exceptions to this rule and offers close to double the purported resistance to boot. The majority of users claim to never get bored using their Power Rod gyms and the overall build quality of the frame, cables and the superior range of motion offered by each attachment are just what a serious beginner needs to serve their workout needs for many years to come. Now we’re stepping up to a higher level of quality in the home gym market. 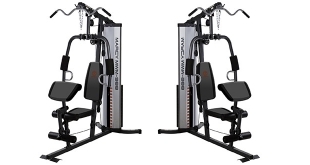 In this price range, you’ll receive a machine with sturdier construction and more available exercises, along with additional resistance and upgrade options. Body-Solid consistently makes it to the top of any list containing home gym equipment. Like the less expensive G1S, the StrengthTech EXM2500S comes from the same lineage as the very first EXM1500S. This particular machine has hit #1 on the Consumer’s Best Buy list more than once since its release in 2009. This StrengthTech model has a larger footprint than those recommended thus far, but the added dimensions give you, even more, convenience in the form of two separate multi-function workout stations. More exercise options mean a slightly larger footprint at L 83″ x W 51″ x H 83”. Assembly of the EXM2500S generally averages most people around 3 hours and is moderately difficult to assemble. Comes with a lifetime warranty (as long as you own it) on all parts. Rated #1 on the Consumer’s Best Buy list of home gyms. Uses Body-Solid’s patented “Selectorized” no-cable-change pulley and cable design. Two separate workout stations (leg developer/lat pulldowns and press/pec deck) to allow for easier transitions between exercises and obstruction-free movements. Offers 30 solid, gym-quality toning and strengthening exercises. 12-gauge steel frame and 2200lb tensile strength resistance cables. 210lbs available resistance offered in 10-pound increments (Note: the open stack design allows the “jerry-rigging” of additional weights onto the stack, though it will void your warranty if Body-Solid were to find out). Silent, maintenance-free operation because of the high-quality steel ball bearing pulleys. A wide range of adjustment available on both the leg and pressing station, making this easier for everyone to use comfortably. Uses DuraFirm pads on all stations to ensure the most comfortable, pain-free workouts. Lifetime warranty on all parts for as long as you own EXM2500S. Complicated assembly instructions are a frequent complaint (local classifieds are easy places to find people in your area that offer in-home equipment assembly services). On the other hand, you can always opt-in for more expensive Home Gym Assembly service from Amazon. 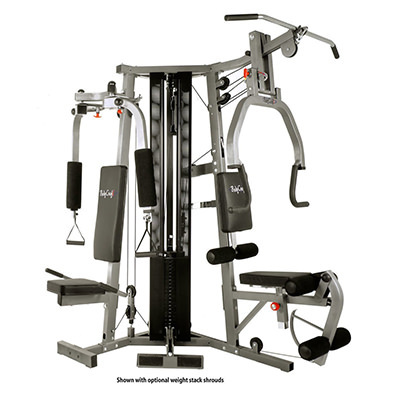 There is no leg press or squat station on the EXM2500s, though you can purchase this add-on leg press station if your workout space can accommodate it. No cardio station included, though this is more of a reality with most all-in-ones in general than it is a legitimate drawback of this particular equipment. If you have room for, and decide to purchase, the optional leg press attachment the StrengthTech EXM2500S has really no limitations when it comes to getting a full body workout. The lifetime warranty offered by Body-Solid for this all-in-one makes the StrengthTech EXM2005S a no-brainer when it comes to making a purchase decision in this price range. Like others we’ve rated already, the EXM doesn’t offer enough resistance to make you into a gorilla-necked-power-lifter, but the 210lbs of safe resistance and the super convenience offered by the no-cable-change “Selectorized” system make this quality built home gym a must for people who’re serious about getting a body-toning workout right in the comfort of their own home. The Bowflex Xtreme 2SE is a step up from the Blaze mentioned earlier. It boasts 70 available exercises and looks really impressive sitting in a corner when not in use. One unfortunate drawback is that here is no rowing option found on this machine, unlike the lower-priced Blaze and high-end Revolution models that are also made by Bowflex. Compact footprint of L 62″x W 49″ x H 81″. Comes delivered in a single box and assembly is a breeze. Power Rods are fully warrantied for the life of the machine. 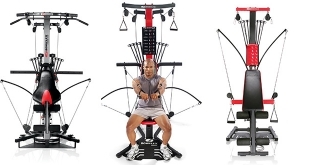 Bowflex is considered by many to be the best all-in-one home gym manufacturer in the business. 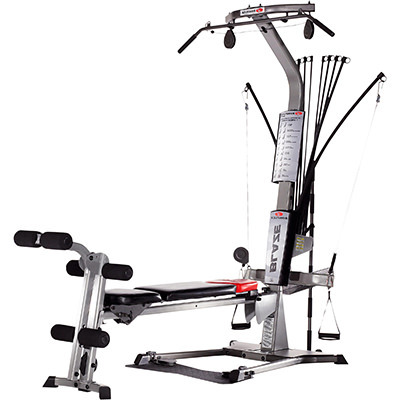 Over 70 gym quality exercises are possible on the Xtreme 2SE (including 18 back exercises). Functionally-designed pressing station distributes weight equally to each side of the body for balanced muscle and strength development. The squat station is included, meaning you can do compound exercises for the lower body as well as the upper. There’s zero chance of getting hurt by falling weights. Multiple adjustment polyurethane seats are super comfortable and long lasting. The Power Rod resistance and multiple pulley positions allow for more grip angles and flexibility including regular grip and no grip options: e.g., wrist cuff, ankle cuff, foot cuff, and shoulder cuff. Out-of-the-box resistance is 210 pounds, with the ability to upgrade to 310 and 410 pounds by purchasing additional 100-pound Power Rod upgrades. The Xtreme 2SE has a much smaller footprint than stack based machines thanks to its unique X-shaped base that gives this machine the ultimate in stability. Lifetime warranty on the Power Rods means you never have to worry about wearing them out and having to replace them down the road. The resistance options are limited to 410 pounds after completing the 310 and 410-pound upgrades. As with the Blaze, users of this Bowflex will find the resistance to be different from that offered by weight stack or free-weight exercises, though if you’ve never used either consistently it’s unlikely this will be a drawback for you. There’s no rower option available like with the less expensive Bowflex Blaze and the granddaddy of all Bowflex machines – the new Revolution (see rating in the under $3000 category further down). The footprint is fixed; there are no space-saving features for storage when not in use. The Xtreme 2SE is a great piece of home gym equipment if you’re okay without the rower that’s included with the Blaze and Revolution models. Truthfully, cable rowers will never offer the kind of workout that an impeller-based rower like a Concept 2 or Water Rower can. The squat station makes this and the other Bowflex units rated on this page to be superior to most of the all-in-ones on the market today who only offer leg extensions, leg curls and some who offer additional adduction/abduction exercises for toning the hips and glutes. The Xtreme 2SE is also highly sought after by taller people over 5’10” who find it hard to fit into and get a good range of motion out of their home gym equipment. 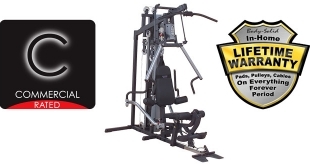 Overall, the 2SE is stellar quality home gym equipment. The lifetime guaranteed Power Rods makes this a machine that could conceivably last you forever. The Galena Pro from BodyCraft is truly impressive! Like the StrengthTech EXM2500S, the Galena Pro has put 2 seated workout stations in one piece of equipment. One station offers a pressing, pulldown and leg development workout, while a dedicated pec/leg press station offers a traditional pec deck and dumbbell-style flyes using cables, in addition to the 300lb leg press with the adjustable footplate. The 300lb leg press is a huge selling point for this high rated all-in-one. Reasonable, but still large footprint of L 72″ x W 58″ x 92″. As with most stack-based gyms, installation usually exceeds 3 hours and is best with a helper. Lifetime guarantee for as long as you own the Galena Pro. The Galena Pro is designed to accommodate a wide range of user heights, making it desirable for those who’re above or below average. 200lb of stacked weight resistance, using precision cut and weighted plates. Super quiet operation due to precision bearings and perforated steel shrouds built into the weight stack. Heavy-duty frame and attachments are made of rugged 2 x 3” and 2 x 2” steel tubing. 2000lb tensile strength, 7 x 19 strand aircraft cables. 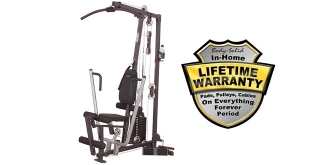 Patented pec deck is considered by many to be one of the most versatile designs available on a home gym. Included leg press offers 300lb of resistance. Multiple hand and seat positions for doing flat, incline and shoulder pressing from a variety of angles. Lifetime warranty included for all parts for as long as you own your Galena Pro. Resistance is limited to 300lb on the leg press and 200lb for everything else (though the stack design does lend itself to adding extra weight if you choose). The footprint is large and there is no space saving storage features on the Galena Pro. No dedicated cardio station or exercises are available with this machine. Even though the footprint is larger than the other all-in-ones we’ve mentioned, there are a few distinct selling features to consider with this home gym, such as the dual-purpose pec deck and the included leg press attachment (which was first offered as an add-on option). The fact that you can buy the BodyCraft Galena Pro with a leg press station included is a real bonus that few competitors will offer without charging extra. Another big bonus to buying this mid-level BodyCraft home gym is their commitment to comfort. Comfort for tall people, comfort for shorter people, and all round comfort about the range of motion offered with each and every exercise. The lifetime warranty offered on all parts is certainly nothing to sneeze at either. Sadly, the Xtreme2SE from Bowflex isn’t as compelling as other two machines compared in this price category. Not to mention, the company didn’t include a rower with this particular offering. Meaning, you’d have to go with the affordable but less advanced Blaze, or up the budget to buy the newer Revolution in order to have that feature. The Body-Solid StrengthTech EXM2500S comes a close second place in our list, but the drawbacks still weren’t worth it in our opinion. There is a leg press available, but the resistance is limited to 200lbs and the press attachment costs extra and is sometimes hard to find in stock anywhere. Not to mention that with leg press included, the EXM would cost the same as the Galena Pro. In the under $2000 category, we simply must recommend the BodyCraft Galena Pro. 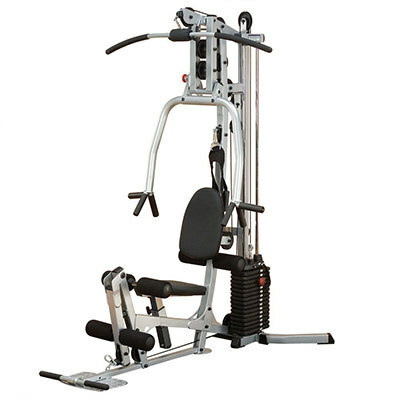 It offers a leg press with a considerable amount of resistance available, while the unique pec deck station and ability to add extra weight to the stack as needed will make it hard to max out on this machine anytime soon. Now we’re stepping up to the big leagues when it comes to non-commercial grade gyms. These home gyms are built stronger to accommodate more weight resistance, offer more exercises per body part, make for faster transitioning between exercises, and which offer all-around better build quality with regards to the frame and working parts. When you spend a few bucks more on an all-in-one gym, you really do get what you pay for in terms of better technology, offering luxury-level comfort and space-age technology that works for more muscle groups in a shorter amount of time. When you step up to a machine like the G6B, you have more room to work in and more available exercises, like the seated row station with adjustable footrest and the ability to do adduction and abduction exercise using the leg developer station and low pulley setup. Great footprint of L 85″x W 50″ x H 83.5″. Assembly is time-consuming but not difficult because of the comprehensive instructions provided. Comes with a lifetime warranty on all parts as long as you own the machine. 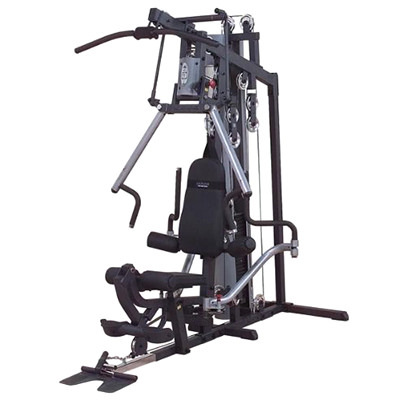 The design of this machine is much more open, leaving the user feeling less cramped and reducing the chance of bumping into the not removable parts while performing certain exercises (this machine is made for a range of user heights including people over 6ft tall). 210 pounds of resistance with an optional 50-pound upgrade possible to 260 pounds. 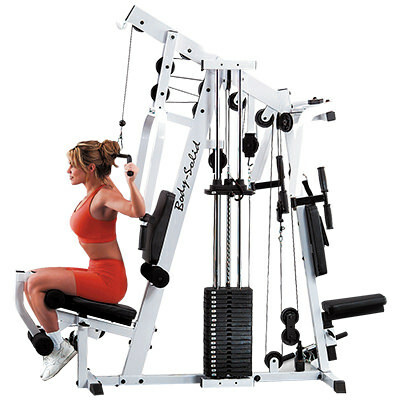 The functional and patented “Bi-Angular” converging press station works the muscles of the upper body 25% more than other machines, allowing the user to choose between the feel of barbell-style movements or more challenging dumbbell movements while doing chest and shoulder pressing exercises. “SmoothGlide Bearing System” on leg developer station makes it easy to do a range of leg, glute, and hip strengthening and toning exercises safely. No cable change “Selectorized” design makes it easy to transition from one exercise to the next (this machine is perfect for circuit training). 2 x 3” mainframe uses 11-gauge steel for maximum stability and safety. 2200lb high tensile strength, military-grade aircraft cables. Gas assisted, a telescoping seat for easy adjustment on the fly. Lumbar support in backrest with super high-density “DuraFirm” pads used throughout for maximum comfort while working out. Includes seated row with a foot brace. Lifetime warranty on everything as long as you own it. Assembly can be a real chore, which is really no different from most other stack-based all-in-ones (expect to devote a few hours or more if you don’t have a helper). Weight stack needs to be lubricated periodically to prevent noise. Doesn’t have any space-saving features other than the retractable footrest on the seated row. Machines in this price and quality category aren’t really much different from their commercial counterparts. The open design of the G6B will be a welcome change if you’re upgrading from a cheaper machine; many of which tend to have smaller footprints, often at the expense of cramming different attachments into a small area. 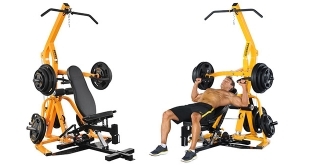 The Bi-Angular pressing station is a real technical innovation and allows users to get a better contraction and wider range of movement while doing chest and shoulder presses. Overall, you get what you pay for and the G6B offers gym quality comfort and range of motion, packed into a well-built commercial-grade machine that’s sure to last for as long as you choose to own it. The BodyCraft Xpress is a really easy machine to use (though not to set up!) 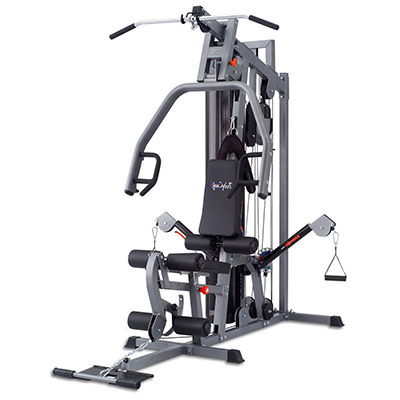 and its height-accommodating adjustment features may just be the best available in a non-commercial grade home gym. The seating area is spacious and non-constricting, while both the bench and leg press are designed with a 2:1 weight ratio that allows 400 pounds of resistance using either station. The upper, mid and lower pulley connections on the Xpress Pro make it easy to get creative with angles when performing shoulder, arm, and core exercises. Footprint competitive with others in this category at L 82.9” x W 56.5” x H 83”. Assembly is time-consuming, comparable to most other stack-based home gyms. 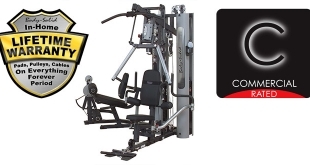 Like the G6B and Bowflex Revolution, the BodyCraft Xpress Pro is made with taller people in mind, with its large and accommodating workout area and adjustment features on the bench, leg developer, and leg press stations. Fully adjustable seat and back, with built-in lumbar support. 12-gauge steel tubing used on frame and attachment arms. 2000 pounds high tensile strength cable used, with steel ball-bearing 4 ½-inch pulleys. No cable change design means no fumbling with cables and clips between different exercises. 200 pounds are available on the stack in total (no upgrade option). 2:1 ratio on bench and leg press station doubles the available resistance to 400 pounds. Press arm allows multiple starting points to accommodate for different arm lengths. Adjustable, self-aligning arms on leg developer station designed to accommodate the perfect range of motion for any user (i.e., tall and shorter people friendly). Lifetime warranty on all parts of the Xpress Pro. We’re almost making a cliché out of cable-based resistance machines and tough assembly by now, but the fact that there are several parts and this is a big machine, installation in your workout room will take at least a few hours. The gym only offers 30 true exercises, though high-quality exercises nonetheless. The 11-gauge tubing would be preferable for a stack machine in this price range. One of the biggest complaints you’ll see about home gyms is their lack of adjustment features – particularly for people who’re above average height. The adjustment features offered on this machine really make it stand out, with perhaps its only viable competition being in the Bowflex Revolution rated next. Another huge selling point is the 2:1 resistance ratio on the bench and leg press. The ability to go up to 400 pounds on these stations can mean for some really intense strength and muscle gains using this machine. The resistance offered by this machine, along with its height-accommodating adjustment features make it a clear contender for the best home gym in the under $3000 category. The Bowflex Revolution has been around since 2006 and is the latest home gym release from the company that completely “Revolutionized” resistance technology for home gym enthusiasts in 1996. 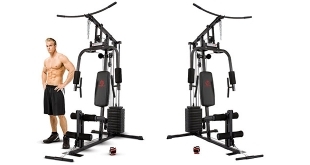 While the company’s Power Rods were used for decades on all Bowflex home gyms, the Revolution offers the next generation in resistance technology with their “Spiraflex” coils, which snap into place easily on the side of the machine, similar to loading plates on a free-weight station. The Revolution offers more exercises than any single home gym machine with at least 100 exercises (30 more than the Xtreme 2SE). In use, for most exercises, the footprint needed to use the Revolution is L 120″ x W 84″ x H 83″ (folds to: L50” x W 38” x H 83”). Setup is a breeze and transport wheels are attached to the bottom of the machine for easy moving around the room. The only all-in-one trainer to offer 100 true exercises in one piece of equipment. “Freedom Arms” allow for a near unlimited range of motion, allowing the user to hit all upper body muscles from every conceivable angle and to also accommodate users in the 6ft and taller range (each arm adjusts up to 170 degrees from top to bottom). “Spiraflex” resistance plate cartridges offer a more realistic comparable resistance to free-weights, making this one perfect for people who want to build strength and muscle mass. You never have to change any cables with the Revolution – a feature that isn’t available on any other Bowflex machine. 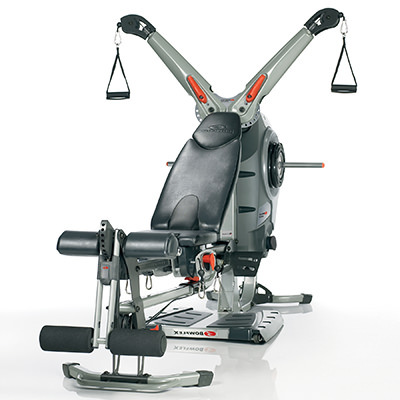 Leg press included with a 5-position harness that allows for multiple foot and toe positions. Includes a cardio rowing feature that was absent from the Xtreme 2SE. Folding design more than cuts the length and width in half for easy storage, while the wheels mounted underneath allow for easy movement within or outside your workout area. Assembly is ridiculously easy compared to stack based home gyms. Available add-ons like the preacher curl and ab developer attachment ensure you never get bored with this machine. The included Revolution Workout DVD takes you through every exercise. This Bowflex machine offers more chest, shoulder, arm, leg, and core exercises than any other home gym on the market. The Spiraflex cartridges, frame and other parts are “only” warrantied for 10 years (though this is still a long time and you can replace them no-questions-asked, during this period). The working footprint of L 120″ x W 84″ x H 83″ may not work for people who have only a small space to accommodate their home gym (this is due to the Freedom Arms which require more width to allow for the increased range of motion and the added seated rowing station on the front of the machine). The feel of the resistance can take a time to get used to. The Bowflex Revolution completely blows all other all-in-one home gyms on this page out of the water. It’s been doing so for the entire 10 years it’s been on the market. So diverse in the exercises and range of motion it offers, with such high-quality parts and design, and so user-height-friendly. With Spiraflex, Bowflex has managed to extinguish the one drawback that everyone said would never allow all-in-one home gym machine to replace specialized gym machines or free-weights: i.e., the resistance quality of Power Bars as compared to the weighted resistance offered on stacked machines and free-weights. With 100 available exercises and a warranty anyone can live with, the Revolution simply cannot be beaten on price, technology or build quality. The fact that this home gym made it to the top of our list should come as no surprise. If the Body-Solid G6B and BodyCraft Xpress Pro are the Cadillac Escalades of home gyms, the Revolution is the Rolls Royce Phantom! Working out is hard to do. Choosing the right home gym to get started is even tougher when your hard-earned cash is on the line. We at BestHomeGym.net are here to make it as easy as possible to find the right equipment for you – your needs, goals and available workout space at home. Feel free to bookmark us, subscribe to our social channels, and subscribe to our RSS feed for breaking information about home gym equipment, home workout tips and other information as we post it.